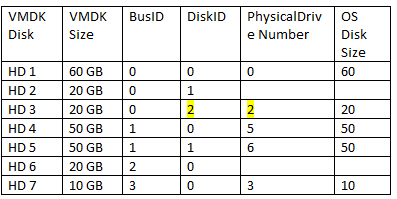 This post comes from a colleague of mine who couldn’t find a great resource on how to correlate the Windows Disk in Disk Management, with the Virtual Disk presented by VMware. When all the disks are different sizes it is easy, but sometimes they are the same…how can you be sure you are expanding the right disk? These instructions/steps should allow you to correlate Windows Disks to VMDK Disks. This script should allow you to match the OS disks to the VMDK Disks. The output will be referenced in later steps. The second step is to get a list of your VMDK disk information by editing the virtual machine in question. Reference OutputPhysicalDrive.txt and match up any OS disks to VMDK disk that have a unique size. 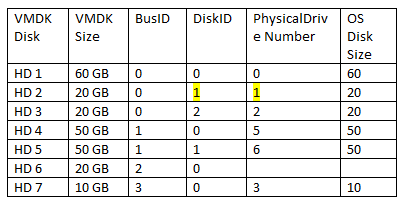 For the non unique drives you will need to match the Windows disk scsitargetid with the VMDK Disk ID. The first 2 in the example below are both 50GB Drives. The next 3 are all 20GB drives. Hope this helps anyone else having the issue. I’ll loop around and update the PowerShell script I ended up using for this soon as well. Thank you vRad for this great guide!